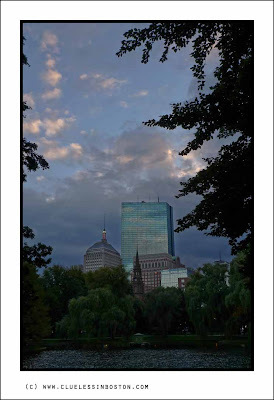 View of the Boston skyline from the Public Garden. View other Skywatch Friday photos click. What a beautiful sky! Love those puffy, pink clouds! Terrific capture! I like the way you placed the building and the trees in this cityscape, with clouds filling all the rest. You give Boston nobility, fragility, and tranquility in this one image. Impossible, but you've done it. Great work. It's beautiful! When you enlarge it you can see reflections in the tall building. A brooding sky, looks like the weather is on the change. Yup. You get the prize for picking that up. I just love Boston! Beautiful pic!